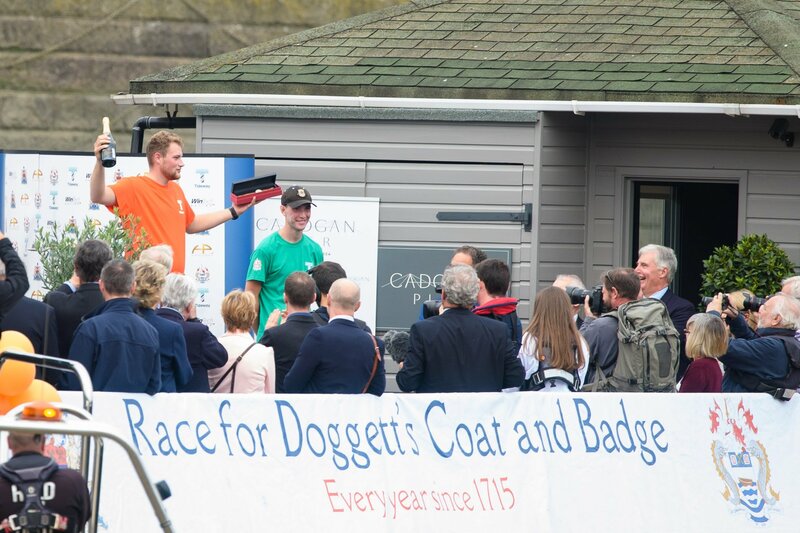 This year’s Doggett’s Coat and Badge Wager took place on 4th September 2018. This competitors were Alfie Anderson, 23 (Poplar, Blackwall and District RC) and George McCarthy, 24 (Globe RC). Following the Draw, which had taken place at Watermen’s Hall on 12 July, Anderson rowed in orange from Station 4, while McCarthy wore green on Station 3. It was an extremely well fought race with both competitors putting their hearts and souls into it with Alfie Anderson being the eventually winner. But well done to both rowers who are a credit to their sport. The Wager formed part of a Riverside Exhibition outside Tate Modern between 18 August and 30 September and has its own Exhibition in the Guildhall Yard from 7-25 September. Oral histories and photographs are being recorded of previous Doggett’s contestants and a film produced about the Wager’s history. Aboard the Company boat following the race was a film crew – so watch this space! Alfie in orange and George in green after the race. 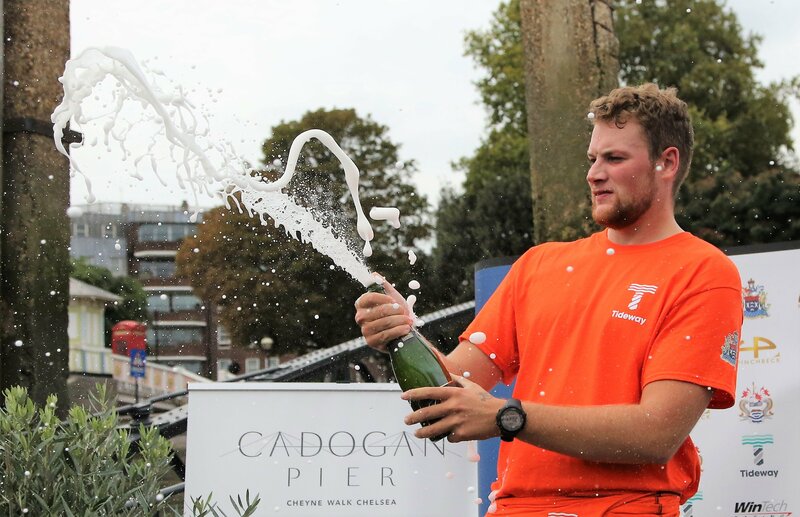 The race started at 16.00 this year -as it was part of the Mayor of London’s Thames Festival. 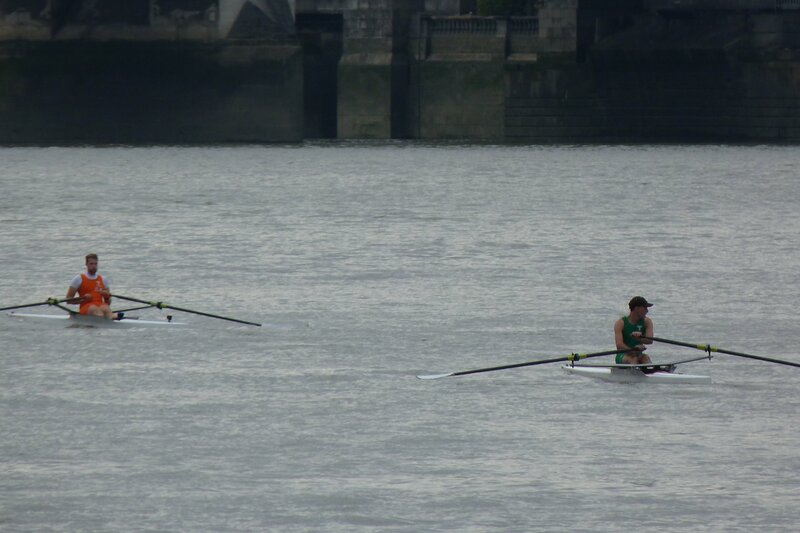 As can be seen from the times it was a close race with both rowers giving of their best.